All paintings have a story and even maybe a byline. This one has a byline. I painted it the day my brother died. I’d cut it into a thousand pieces if I could get him back. The last strokes went on when the phone rang. I was painting it for Wayne Jackson. Creek paintings are plentiful. F amous creek paintings I cannot seem to reference. Maybe this should be one. Things don’t turn out that way though. My first effort with this photo was this smaller creek painting . This painting was owned by Wayne and is now in my possession. I had just started painting and he put it on his wall and bought a light for it. This sparked my painting efforts. The creek, in particular passenger creek has always been special for me. The creek represents a small out of the way unnoticed peace and tranquility. A place of small sounds, insects and birds. I grew up on a farm on a creek. My earliest memories are walking the trails beside this little creek, fishing and swimming with my brothers. These creek paintings were my earliest efforts and maybe my best. They were impressions of peaceful times, of good times as a child. Oil paint has a way of becoming more translucent over the years. 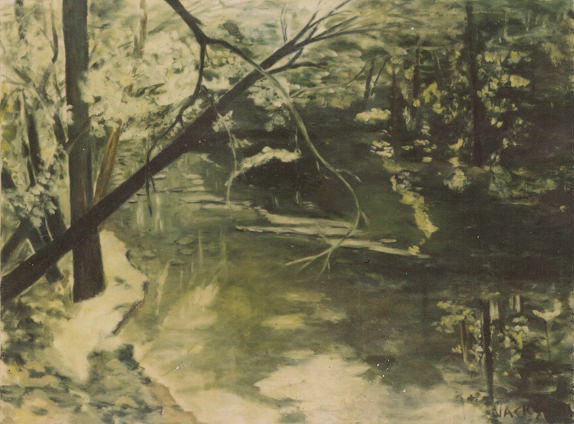 These creek paintings were painted in 1989. A few years later I began painting on paper and painted this last painting of the creek. This one is dated 1992. It is the last of the series. 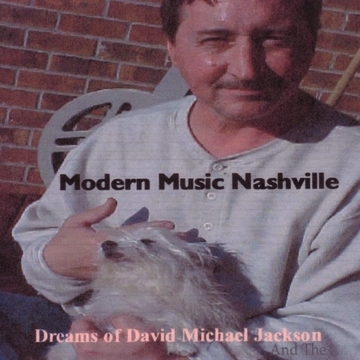 Here i s a pic of my brother, Wayne Jackson. Here is a link to his poems. He was, and is, my brother and friend. These paintings and my art are dedicated to him. He encouraged me. That is the greatest gift.